James R. Edwards, Jr., Ph.D., is a Fellow with the Center for Immigration Studies and coauthor of The Congressional Politics of Immigration Reform. 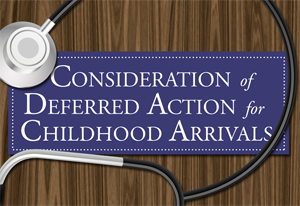 Recipients of deferred action under DACA will not qualify for Medicaid, the Children's Health Insurance Program, or a new program for insuring those with preexisting medical conditions. DACA beneficiaries are not considered eligible for these public health programs because the amnesty program was adopted solely for Homeland Security purposes and not those having to do with expansion of health coverage. Existing statutory and regulatory definitions of "lawfully residing" and "lawfully present" in health contexts bear on the government's determination with regard to DACA. The implementation rule specifies the Systematic Alien Verification for Entitlements (SAVE) system as the primary means of electronically verifying immigration and citizenship status in health program eligibility determinations. Illegal aliens receiving quasi-legal status through DACA who seek to defraud federal health care should be identified through the SAVE system. But an alternative method provided in the implementation rule could provide a loophole for fraud and abuse. The ACA's individual mandate requiring health coverage or payment of a penalty seems not to apply to DACA beneficiaries. On June 15, 2012, the Department of Homeland Security announced that most illegal aliens purporting to be under age 31 and claiming to have come to the United States as a child would be granted a two-year legalization.2 Further, most amnesty recipients could seek a work permit. This "legal" status could lead to acquisition of a bona fide Social Security number. Amnesty applicants with a "serious" criminal record may be turned down, although such an overwhelming volume of applicants will likely cause DHS to approve questionable applications, even of criminals and frauds, instead of adequately screening and denying those who would actually not qualify. The "Deferred Action for Childhood Arrivals" initiative unilaterally applies an exception-making policy known as "deferred action", normally reserved for use on an extraordinary, case-by-case basis, to an entire class of illegal immigrants.3 This step is remarkable for its breadth, covering about one-fifth of the estimated illegal population, as well as its wholesale application of what can only be described as turning the exception into the rule. The amnesty stratagem came about because Congress has declined to enact the DREAM Act legalization bill, despite its being introduced in a string of Congresses. The DREAM Act would confer permanent legal status on the same class of illegal aliens as DACA. The bald-faced exercise of enacting, by executive branch fiat in defiance of congressional will, any policy outcome that rightfully remains the prerogative of the legislative branch disregards the separation of powers delineated in the U.S. Constitution. Border Patrol and Immigration and Customs Enforcement rank-and-file have sued over the action. The Obama administration's highly controversial move has engendered broad speculation that the White House sought to award a political favor to a particular group of political allies leading up to the presidential election. Homeland Security asserts that the unprecedented application of this limited discretion relates to aligning its enforcement practices with its enforcement priorities. The Affordable Care Act, which became law in 2010, and which the U.S. Supreme Court upheld in 2012, contains several provisions intended to extend health coverage and reduce the number of individuals without insurance. Effective 2014, the ACA expands Medicaid coverage to those earning up to 133 percent of the federal poverty level. It institutes a graduated subsidy for those with household incomes between 133 percent and 400 percent of the poverty level. Medicaid, a medical care welfare program, will also be extended to childless adults. Federal mandates on insurers require allowing adult children up to age 26 to obtain health coverage through their parents' insurance (the "slacker rule"). Both subsidy level determinations and Medicaid eligibility will occur through health care "exchanges" operating in each state. In addition, a short-term program affords health coverage to individuals with preexisting medical conditions, the Preexisting Condition Insurance Program. As discussed elsewhere, the ACA statutorily limits qualification for Medicaid and insurance premium subsidies to the "lawfully present".4 Illegal immigrants are exempted from the law's mandate requiring individuals to have health insurance or face a fine (which the Supreme Court renamed a "tax"). Two-year relief from possible removal and de facto legal status, particularly with respect to beneficiaries who obtain a work permit, inevitably raise questions about beneficiaries' eligibility for various federal benefits. The administration has answered some of those questions with regard to health programs. Further, CMS based its conclusion on previously set Medicaid and CHIP statute and regulatory definitions of "lawfully residing", the term that appears in the 2009 CHIP reauthorization law. Illegal aliens may not enroll in these safety net programs and may only obtain emergency medical treatment at taxpayer expense. CMS guidance of July 1, 2010, states, "[P]eople who are undocumented were not eligible for Medicaid (except for emergency services) before PRWORA [welfare reform], and remain ineligible under CHIPRA [CHIP reauthorization]. "8 CMS explains, "In interpreting 'lawfully residing', we will rely on existing immigration regulations for the purpose of defining lawful presence and longstanding Medicaid rules to establish residency. "9 This means established immigration rules determine whether an alien's presence in the United States is lawful and standing rules governing Medicaid residency (i.e., determining one's state residency) apply to health program qualification within a given state. CHIPRA chipped away at welfare reform, including its five-year waiting period for legal immigrants to qualify for programs like Medicaid, their financial reliance upon the immigrants' sponsors' incomes, and other safeguards of taxpayers through public charge doctrine.10 CHIPRA allowed states to cover all immigrant children and pregnant immigrant women through Medicaid and CHIP, regardless of welfare reform's personal responsibility requirements. However, CMS seems to draw the line on DACA as not qualifying its quasi-legal aliens for these health programs. Lawfully Present. CMS's 2010 CHIPRA guidance asserts that alien children or pregnant women regarded as "lawfully present" include certain aliens paroled for under a year, while disqualifying those "paroled for prosecution, for deferred inspection, or pending removal proceedings".11 Other beneficiaries of medical welfare coverage include certain temporary residents, aliens granted Temporary Protected Status (TPS) with employment authorization, certain aliens with employment authorization, and aliens currently in deferred action status. It is important to note that CHIPRA left it to the states to decide on expanding Medicaid and CHIP coverage; that is also effectively the ruling of the Supreme Court on Medicaid expansion in the ACA. This expanded coverage and the descriptions of those newly eligible under CHIPRA applied only to immigrant children and pregnant women. Intent to expand coverage plays in CHIPRA, not ACA. The potentially most relevant parts of the CHIPRA guidance letter's "lawfully present" definition, as it relates to DACA, are those aliens who secure employment authorization and those in deferred action status. However, the 2012 CMS guidance specifically states that DACA amnesty recipients do not qualify for the Medicaid and CHIP programs, including those who may obtain a work permit. Eligibility Verification. Section 1411(c)(4) of the health reform law requires verification of individuals' eligibility for participation in health programs based on citizenship and immigration status. The July 30, 2012, Federal Register notice implements this provision. CMS cites the existing mechanism used for verifying individuals' immigration status for means-tested program eligibility. The rule specifically names the Systematic Alien Verification for Entitlements (SAVE) system. "In many cases, states may be able to automate verification of citizenship and immigration status by leveraging existing data exchanges that are currently in place for other programs, such as Medicaid and the Children's Health Insurance Program. The Department of Homeland Security's U.S. Citizenship and Immigration Services (USCIS) Systematic Alien Verification for Entitlements (SAVE) program provides [an] online system to verify an individual's immigration status. "12 Thus, the SAVE system would seem to serve as the default electronic verification for program eligibility for health reform. Therefore, CMS has taken a step toward use of the established SAVE program as the electronic verification employed for ACA. It should be capable of identifying and declining public health benefits to DACA recipients who attempt to defraud the government. However, the provision of an "alternative method" of verification remains a potential loophole. Coverage Mandate. Health reform exempts illegal aliens from both the individual mandate to have health insurance and the fine for failure to have coverage. Despite the fact some DACA beneficiaries will get work permits and Social Security numbers, their ability to stay in the United States under quasi-legal status remains tentative. At heart, the DACA class of illegal aliens remains illegal aliens. Thus, they escape the requirement to obtain health coverage or else pay a monetary penalty, which the health law imposes on legitimate U.S. residents. There is little to keep quasi-legal DACA residents from obtaining private health insurance coverage. Many will be offered health benefits through employment, and younger people typically enjoy lower insurance premiums because they tend to be healthier than older people. A complicating factor will be if their employer seeks employment-connected health insurance through an exchange, depending on the citizenship and immigration status verification system used in that state. This should identify those not qualified on immigration status for premium subsidy or Medicaid. Whether or not they become insured, DACA recipients will still receive emergency care at hospitals and community health clinics, billed to Medicaid. The DACA amnesty seeks to achieve through administrative means a policy goal the Obama administration has failed to achieve legitimately, through the legislative process: legal status for younger illegal aliens who claim to have come to this country before turning 16. The health reform law now being implemented seeks to cover most U.S. residents with some form of health insurance, either in a public program such as Medicaid or a private insurance policy. The administration's exercise of "deferred action" on a wholesale basis, though legally suspect and constitutionally unsound, falls short of granting a bona fide "immigration benefit" to DACA amnesty recipients. Thus, it is wise not to regard these people as covered under health reform's benefits (or liabilities). To do so would add insult to injury to both health and immigration policy and further complicate a nettlesome policy intersection. Further, these illegal aliens' status remains insecure beyond two years. Many of the relevant provisions of the health law will not become effective until 2014, leaving these aliens a short window to qualify for public health programs before their provisional immigration status expires. Extending health benefits to those lacking an immigration benefit and for a fairly short term would unnecessarily put at much greater risk the true victim here: the American taxpayer. Such an unwise move would consume vast amounts of limited public resources that otherwise could go toward the coverage of legitimate U.S. residents. 1 Robert Pear, "Limits Placed on Immigrants in Health Care Law", The New York Times, September 17, 2012. 2 Janet Napolitano memorandum, "Exercising Prosecutorial Discretion with Respect to Individuals Who Came to the United States as Children", June 15, 2012. Deferred action is a more formal way of exercising prosecutorial discretion that is available to USCIS, ICE and CBP. There is no statutory basis for this form of relief, but it is well established as a matter of policy. However, the lack of statutory guidelines makes it especially susceptible to abuse. Deferred action enables the government to make a formal determination not to pursue removal of an unqualified or unlawfully present individual for a specific period of time, usually for extraordinary humanitarian or law enforcement purposes. For example, some foreign students affected by Hurricane Katrina were granted deferred action, as were Haitians who fled to the United States on nonimmigrant visas following the earthquake in 2010. As with other forms of relief, beneficiaries can receive a work permit. The immigration agency has traditionally held that deferred action is a tool that exists for the convenience of the government, and is not an immigration benefit per se, and it has resisted organized pressure to formalize the application process, publicize its availability, and thereby encourage more people to apply. 4 See CIS Memorandum, "Immigration-Related Provisions of Senate and House Health Reform Bills", November 2009. 5 "Pre-Existing Condition Insurance Plan Program Interim Final Rule with Comment Period", Federal Register, July 30, 2012. 6 Cindy Mann, CMS letter of August 28, 2012, p. 1. 7 "Pre-Existing Condition Insurance Plan Program Amendment to Final Rule with Comment Period", Federal Register, August 30, 2012. 8 Cindy Mann, letter to state health officials, Center for Medicaid, CHIP, and Survey & Certification, July 1, 2010, p. 2. 10 See James R. Edwards, Jr., CIS Backgrounder, , May 2001. 11 Mann 2010 letter, p. 3. 12 July 30, 2012, Federal Register notice.